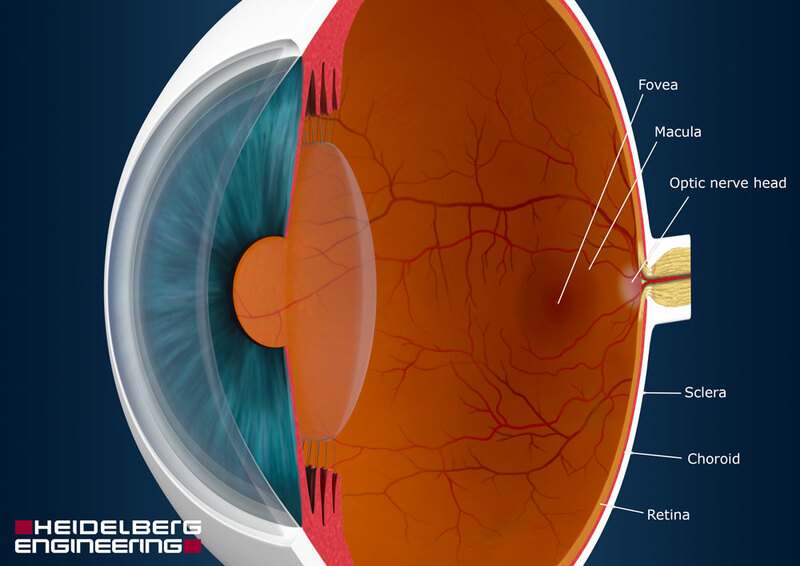 In the posterior (back) part of the eye, the majority of the eye is filled with a gel-like mass called the vitreous body. 80% of the vitreous body consists of water and the rest of protein components and fine connective tissue fibres. It is contained by the inner limiting membrane, the front of which rests on the back of the lens and the side of which is next to the retina, similar to an inflated balloon. At the back of the eye, the retina acts like film in a camera. It is made up of millions of light-sensitive neurons, known as rods and cones. The rods are responsible for vision at low light levels, while the cones are responsible for colour vision. Cones in great numbers are concentrated at the centre of the retina, at the point of clearest vision (also referred to as the macula). In contrast, the rods are located more toward the periphery of the retina. The blind spot is next to the macula, where the optic nerve exits the eye. The optic nerve consists of up to approx. 1.2 million nerve fibres, which transmit detailed information from the retina to the brain. In the back part of the eye, the retina is surrounded by the choroid, which is responsible for the blood supply to the eye and provides it with all important nutrients. As a protective casing, the cornea surrounds the front of the eye and the sclera (the white of the eye) protects the back.